We raise 100% ABGA Registered Boer goats and Percentages. My Boer Goats have been born and raised for the Florida Climate and Parasite resistant. 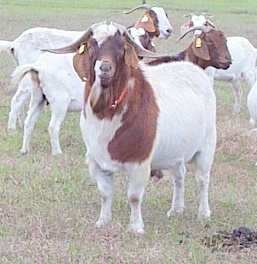 At our Farm we maintain some of the best Boer Goats in North Florida. They have been given the best organically source of vitamins and minerals. These goats go through a Total Health Program. My Boer Goat are what Boer Goats should be Muscle, Heat and Parasite resistant and Healthy. I have for sale: Show and Breeding Does, Bucks, Kids, and wethers. Visit our website for prices. Out of Business for about 8 years now. Please remove us from your website. Thank you.